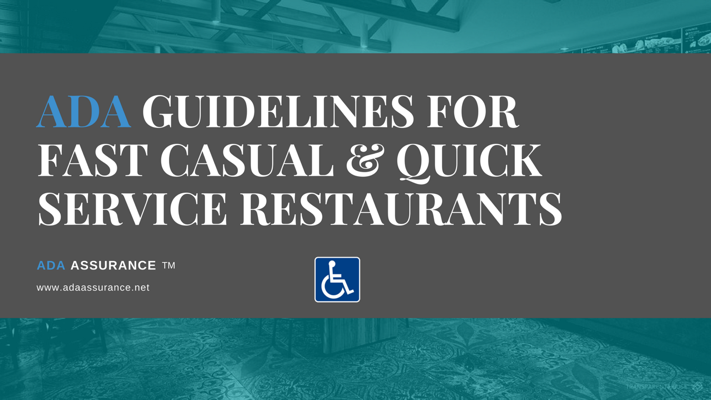 Confused about the ADA regulations and the potential liability for your restaurant? 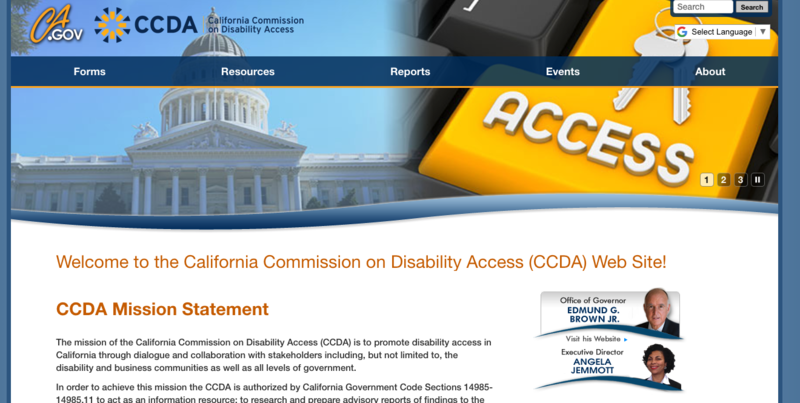 Presented By: Paul Klein, Certified Access Specialist & Principal with CalCasp, Inc.
We are honored to have Angela Jemmott, Executive Director with the California Commission on Disability Access on ADA Shop Talk Episode - 044 this week. In this episode, Angela talks about some of CCDA's achievements, accomplishments as well as some of the challenges ahead and opportunities to participate in their process. You can listen to the show here. It was great to Kaylan Dunlap and Bill Zellmer for a lunch time chat for ADA Shop Talk. We recorded an upcoming episode to be out soon. Bill & Kaylan shared their experience with a 10 year $240 Million Dollar Barrier Removal project. Great insight! Those seeking Certified Access Specialist (CASp) certification may now sign up for the next examinations. ADA Door Pressure Gauges Offered on Amazon Prime! 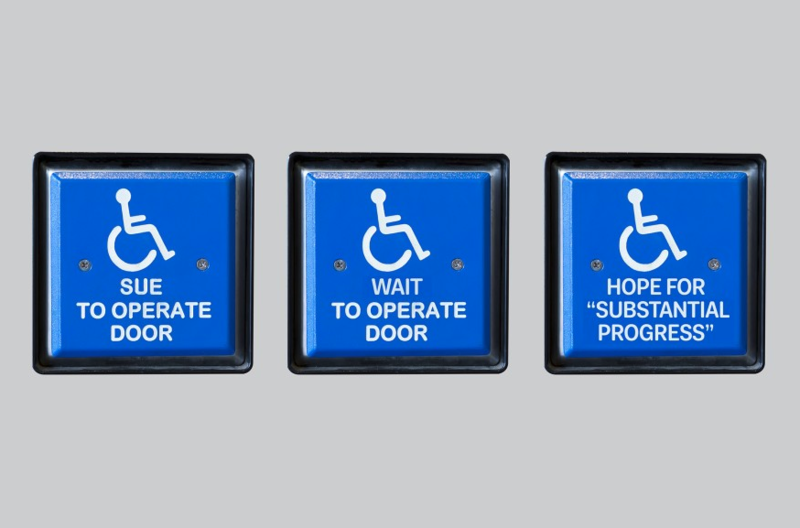 We are please to be able to offer ADA Door Pressure gauges through Amazon and Amazon Prime. 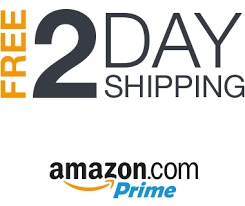 This means that if you are an Amazon Prime member you can get your door pressure gauge delivered for free within 2 days! All orders are backed and fulfilled by Amazon. 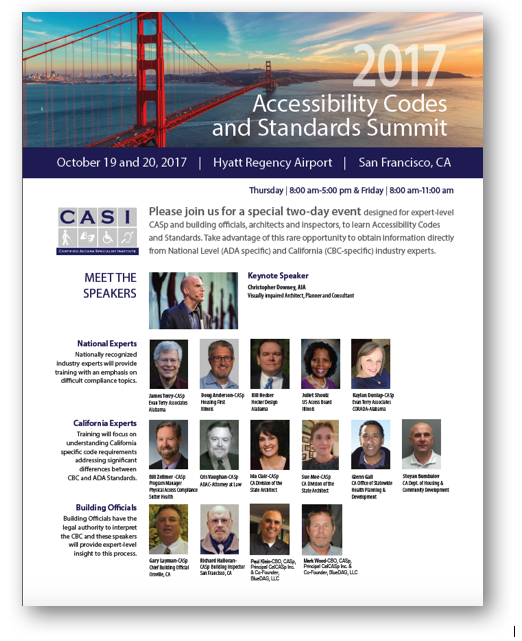 We are excited to announce that Paul Klein & Mark Wood have been asked to be part of the Building Officials panel for the CASI Accessibilty Codes and Standards Summit October 19th & 20th 2017 at the Hyatt Regency in San Francisco. Many people ask "how can I become a Certified Access Specialist (CASp)”? First and foremost, the state’s CASp examination is administer through the Division of State Architect (DSA). You must complete a candidate eligibility application form online at DSA CASp Registration or you can down load a snail mail application form (DSA-600) and start your process to "qualify" to take the examination. The qualification process is very important and is very similar to a job application. The qualification process looks at your experience, education or both in the areas of access compliance and application. This may come from design, construction, inspection, plan review, consulting, or other related fields. It is best to approach the registration process and application like a job application to increase your chances of being approved. Like with any application, incomplete or pertinent information missing may hinder your chances of being approved.